1967 offers many lessons for those who want to counter Trumpism. Mark Twain supposedly said, “History doesn’t repeat itself, but it often rhymes.” The phrase resonates in 2017: There are uncanny connections between the first 100 days of President Trump and much that occurred a half-century earlier in 1967, the year of “the Summer of Love.” As weird and dark as things seem to many of us in 2017, this is not the worst time that America has gone through. Notwithstanding a much better middle-class economy, stronger labor unions, and a more progressive Supreme Court, the political establishment of 1967 was in many respects even worse than that of 2017. Existential dread is nothing new. The nuclear arms race spawned ubiquitous fallout shelters and air-raid drills. (They may be returning after all this time. Last month, Hawaii’s House Public Safety Committee passed a resolution stating it’s in the state’s “best interest” to update its fallout shelters.) Twenty-five million young men were subject to the military draft during the Vietnam War in which more than 50,000 of them would be killed. Police relations with the black community in most of America were even worse in 1967 than they are today. Urban disturbances that summer, and police reaction to them, resulted in unprecedented carnage. (Kathryn Bigelow’s film Detroit, about the 1967 riot in which 43 people were killed, will be released in August.) By the following year, the “white backlash” (which Martin Luther King Jr. acidly called “a new name for an old phenomenon”) was the basis for the “Southern strategy” that helped Richard Nixon convince a lot of racists to vote Republican—a campaign that inspired many aspects of Trump’s in 2016. Today’s alt-right has its antecedents in slave owners, plutocratic haters of FDR, and the John Birch Society. J. Edgar Hoover, Paul Ryan’s idol Ayn Rand, and Trump’s mentor Roy Cohn who were all alive and spewing poison in 1967. Trump is not the first president to invite speculation about his mental health. In Remembering America, Johnson speechwriter Richard Goodwin writes that he was worried about “certain episodes of what I believe to have been paranoid behavior.” Both Goodwin and fellow LBJ staffer Bill Moyers consulted psychiatrists because of their worry that the president was unhinged. Gil Scott-Heron’s classic “The Revolution Will Not Be Televised” was repurposed for the opening credits of Homeland this year. The 50th anniversary of the creation of PBS is juxtaposed with Republican calls for ending its federal funding. What are the lessons from 1967 for those opposed to Trumpism? In Todd Gitlin’s book The Sixties: Years of Hope, Days of Rage, the word “resistance” appears 88 times. It is not clear, in retrospect, that more confrontational tactics did anything to help the cause. Gitlin acknowledges that as the Vietnam War became increasingly unpopular with the American public, so did the anti-war movement. Alienation and rage without positive inspiration spawn apathy, which strengthens the unrepentant right wing. 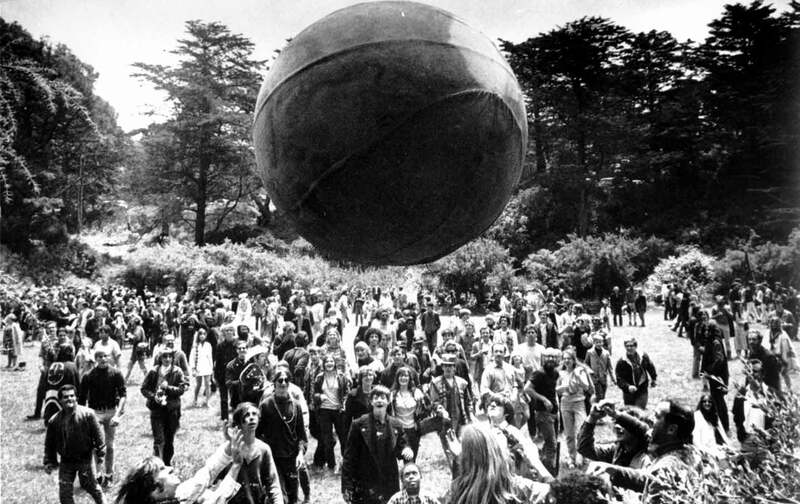 As Ken Kesey and Jerry Garcia, among others, pointed out in the ’60s, protest rooted in anger and polarization—even if temporarily cathartic—usually backfires and creates more darkness than it dissipates. As Naomi Klein suggests in her new book title, No Is Not Enough, the left needs to express a consistent alternate positive vision in broadly understandable cultural language. Secondly, there must be a reduction in tribal schisms. The divide between the “counterculture” that focused more on inner changes and the “revolutionaries” who focused more on political protest helped neither progressive political goals nor a moral/spiritual balance. Among political radicals, the infighting was so chronic that Che Guevara referred to the American left as a “circular firing squad.” One of the primary tactics of the FBI COINTELPRO programs aimed at weakening the anti-war and civil-rights movements was to foment internal discord. A third lesson from the ’60s is that liberal elites need to respect the energy and insights of youth if they want to win. In 1967 as now, the younger generation was the most progressive and largest in history, and yet was largely ignored by most Democrats. (In Shattered, the recently published account of Hillary Clinton’s 2016 campaign, only a single paragraph refers to efforts to communicate with millennials, a reference to an ad Sanders filmed in support of Clinton that was never aired). Finally, there needs to be a balance between action that addresses immediate suffering, and the long-term consciousness-raising that is required to make lasting changes. Carmichael replied, accurately, that nothing the hippies had done had reduced white-on-black violence. Ginsberg countered: “Nothing anyone had done, not hippies, nor the black power movement has reduced such violence so far.” Then, as now, the big moral problems would not be solved quickly even as they commanded immediate attention. Martin Luther King Jr. publicly turned again the war in Vietnam in 1967, his last full year of life, and was castigated both by militants like Carmichael for his belief in nonviolence, and by the establishment civil-rights organization and The New York Times for opposing a president who was “liberal” on domestic issues. At the same time, he was hounded mercilessly by J. Edgar Hoover’s FBI.